This fascinating and moving documentary, narrated by Joan Allen, focuses on Hannah Senesh, a Hungarian Jew who, at the age of 23, joined British soldiers in a paratrooper mission to save Jews from the Nazis in Hungary during the end of World War II. She parachuted and snuck into Hungary while courageously risking her life for the dangerous, yet important mission. One of those whom she saved in Hungary was her very own mother, Catherine. Senesh experienced anti-Semitism early on when she had attended a Protestant high school in Hungary. As the Nazis were invading Europe and in the process of taking over Hungary, she became a Zionist and escaped to Palestine where she became member of a kibbutz, a community that depends heavily on agriculture as a means to survive and where everyone contributes their labor in some way to help the community as a whole. Director Roberta Grossman expertly infuses background information about Hanna Senesh as well as accounts of her thoughts and feelings throughout the mission according to her diary entries and individuals who had the privilege of meeting her. It’s quite inspirational how Senesh was so determined and fervently passionate about taking action to save Jews in Hungary once she heard about Nazis killing and torturing Jews. Listening to the detailed, vivid accounts of her brave mission to sneak into Hungary feels both riveting and emotionally devastating, especially when she gets captured, interrogated and tortured by the Gestapo. Her cellmates describe her as a very bold woman. Comparisons of her relentless courage to that of Joan of Arc are quite fitting. 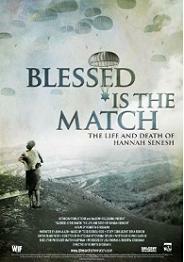 While listening to all the witness accounts along with the powerful, eloquent words taken directly from Senesh’s diary and watching the dramatic reenactments on-screen, Blessed is the Match becomes more than just your standard biographical documentary. Ultimately, it manages to be a captivating, inspirational, engrossing and profoundly illuminating experience. Number of times I checked my watch: 3. Released by Balcony Releasing. Opens at the Landmark Sunshine Cinema.